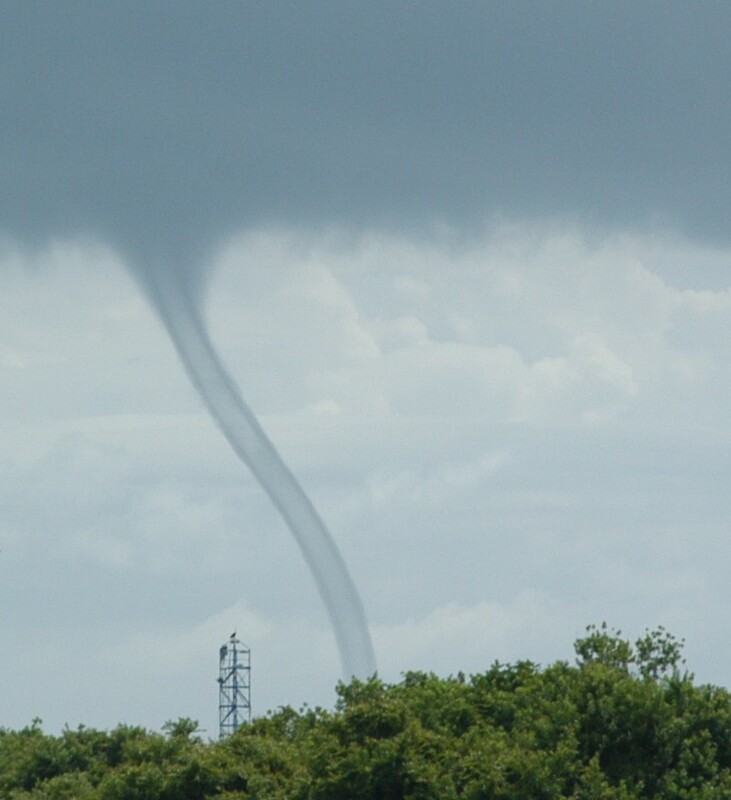 I got to see something pretty neat at work today; a waterspout, which is basically a tornado over water was right in our area so I grabbed a camera and got a shot or two. Amazing, isn’t it? 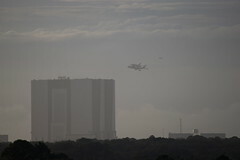 Here is the little video of the launch yesterday that Andy took with the small digital camera we have. Notice how people cheer a little at the beginning and then are quiet until near the end which is when the solid rocket boosters separate. 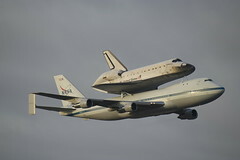 Memories of Challenger are the reason for that. 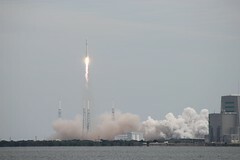 You probably already know, but we successfully launched Discovery today, on the fourth of July. It was a beautiful launch and I felt more pride and accomplishment with this one than ever before, knowing that the work I did with my own hands, such as wiring and welding, left the earth and traveled to space today. I will post more about this later along with a video Andy took, but I am going swimming now- it is freaking HOT here! In the meantime, here are some close-up photos I took out at the space center right next to the press site. The dark line you see in the sky in the last photo is the shadow of the plume of smoke- it is really cool looking. If all goes well, today we will be launching the best Fourth of July display possible, Space Shuttle Discovery. Andy was out there almost all night last night preparing for the mission, and has to go back in a few hours to support the launch. The delays to launch mean working a lot of overtime for him. Where I work, all of our work is done well before the shuttle even makes it out to the launch pad, so there is no scrambling around for us. The photo above is one he took last night with all the lights on the vehicle. Keep your fingers crossed that it goes today, and if it does I will post photos. Andy was actually there working, but I was able to hang out with him and his co-workers as they prepped to go back to the launch pad after the launch. Here’s a photo of Andy checking out an ELSA (Emergency Life Support Apparatus) bottle. 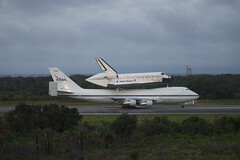 So it is only a few hours away from the next scheduled launch of the space shuttle, weather permitting. Andy has to go out there to work as he is a part of a group called “red crew” which is there to deal with any issues that might arise after thye pad is closed out for launch. I am probably going to drive out there to the center to watch. Normally if a launch occurs during a day or time when you are not scheduled to work, you are not supposed to go out there, but this time I think they realized that the people who make the launch happen should be able to go out and see it close up, even though it is on a Saturday. I am sure the traffic will be horrendous, so I will probably head out pretty soon. Andy has to leave for work in about an hour and he will call me on his cell phone to let me know what the traffic situation is looking like. So far the weather is looking okay. Not great, but okay. It is pretty cloudy, but we may still be all right. We also have to be concerned with the weather at the contingency landing sites around the world as well. Zaragosa, Spain and Istres, France are two of the Trans-Atlantic Landing sites or TAL sites available in the event of an emergency. 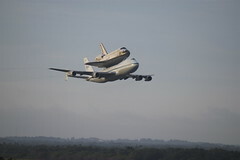 For more information about contingency landings and abort modes of the shuttle look at this website that gives an explanation. Anyway, I am arming Andy with our small digital camera to take a video of thhe launch, and I will take the digital SLR with me to take some photos. More posting later, hopefully. Pray for a safe launch.